Our First Visit to the Christ Reformed Church-UCC, Martinsburg, WV. We both decided to accept an invitation extended by a friend and church member and visited the Martinsburg Christ Reformed Church in early 2015. Though feeling skeptical, we tried to keep an open-minded as we entered through the church doors for Sunday Service for the first time. We wondered if we would be judged or received unconditionally for the persons whom others of the church thought we were! 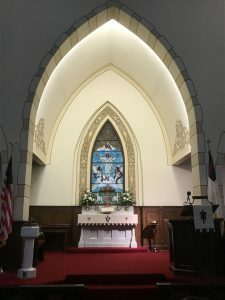 To our surprise when we entered this church, we recalled immediately feeling this was a safe place to allow our shared spirituality to connect to the Higher Power. We felt the architect of the church was simply beautiful and were greeted by members of the church with smiles and seemingly unconditional acceptance. This feeling has continued to grow and today, we find ourselves giving the same warm welcome to other newcomers to our church. Looking back to that first visit, neither one of us thought we would ever become members of any church, but to our amazement, we felt we had connected with a spiritual family and have since become members of this church. We are happy to have found a church of true openness and unconditional love and can say that we are grateful for our new friends at church and look forward to Sunday services and lunch with our church family. We encourage anyone who has had unpleasant experiences with past churches, but still seek a church that is acceptable to all individuals without judgement to come visit our church, speak with individuals in our church, and hear a pastor who is in touch with real world life, and most importantly, with God and the teachings of His Great Love!